You may say that Winstar slot looks much like another popular slot that starts with “Star” (and ends with “Burst”), but come on. There are just that many ways to draw a star, right? The features are different - this one offers a special symbol, that turns into other random symbol (may sound like a standard wild, but it isn’t), and a progressive jackpot. Go turn some stars into other stars. 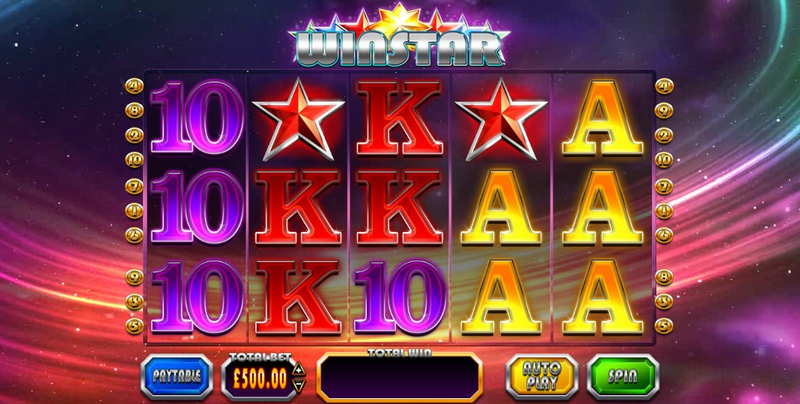 Winstar slot created by Blueprint Gaming takes you to space, where you’ll see red stars, green stars, blue stars, golden stars, and icy-white stars. Fascinating, as Spock would have said. Seriously, that and a bunch of card letters are the only symbols you get. Not that it’s bad, it’s just that some more diversity would be nice. Overall, the slot looks more or less fine. The only features it has are a special golden star symbol, and a progressive jackpot. The game has 10 paylines and 5 reels. This would usually mean that the combinations are pretty rare, but luckily a win counts when symbols are on adjacent reels along a payline, not necessarily starting from the leftmost one. The golden star symbols go in stacks on the reels. Once a spin resolves, all these symbols spin and turn into one random symbol from the paytable. Sounds cool, but in reality it’s rather rare that the revealed “mystery” symbols match the surrounding ones. If it does though - you’re up to some serious wins. Finally, Winstar slot has a progressive jackpot attached to it. There are no special conditions or symbols to trigger it, it just happens randomly at any spin. If all the reels turn gold - you got it. Winstar slot is alright. While not really stunning in terms of graphics, the feature it offers is interesting enough to keep you playing. As well as the progressive jackpot. Click here to play Winstar slot - if the spinning stars favor you, it might be worth a shot.